A pimple is a small inflamed raised area that forms on the skin as a result of a hair follicle becoming blocked with sebum and sometimes also dead skin cells (keratinocytes). Pimples are sometimes also called pustules or papules if they are open and inflamed. When pimples are closed and not inflamed then they are also referred to as comedones. The dermal layer of the skin contains sebaceous glands that produce the oily substance known as sebum. The blocked hair follicle not only contains the sebum and dead skin cells but can often cause an increase in the growth of Propionibacterium acnes bacteria which can cause the pimple to become infected. Staphylococcus aureus can also be involved. The condition in which several pimples are formed is called acne. A pimple can contain white pus which is a result of white blood cells rushing to the area to help with the inflammation. Pimples can occur most often during hormonal changes or from certain cosmetics or sunblocks that block the pores of the skin. Sunblocks that are noncomedogenic are specially designed to prevent this from happening. Hormones can result in an overproduction of the sebum from the sebaceous glands. During adolescence there are large changes in the hormones and in the production of sebum, thus the odds of a pimple forming are increased at this time. Pimples can be treated with salicylic acid or benzoyl peroxide. If this is ineffective or if the acne worsens, prescription treatments, such as Accutane, can be used. Some of these however have bad side effects. A boil is a type of skin abscess that is also called a furuncle. They are caused by Staphylococcus bacteria infecting the skin. Though appearing similar to pimples they are not the same structure. They occur when a hair follicle becomes infected by bacteria, and may become quite painful. They also often contain pus (from white blood cells rushing to the area), along with the bacteria. Boils tend to be much larger than a pimple and they continue to grow. They have a white colored central region which is where the pus collects. Furuncles can join together to form a deeper more extensive structure called a carbuncle. Boils occur most often on the facial and cervical (neck) region. They also occur quite often also on the buttocks and breast area. They can occur where clothing rubs against the skin. 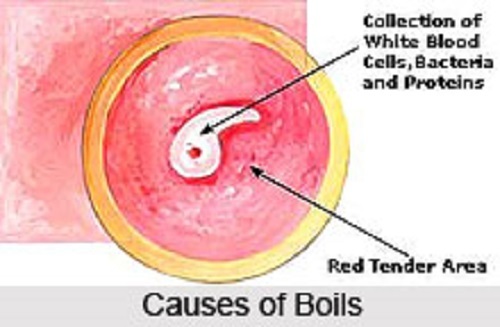 The boils are more commonly found in people with a weakened immune system or chronic diseases such as diabetes. They also occur more often in people living in warm humid climates since such conditions are conducive to bacterial growth. Overcrowded or unhygienic conditions are also conducive to the formation of boils. The boil needs to be cut and pus and contents removed (drained). Antibiotics are also often given to help clear up the infection. Boils can become dangerous if infected with methicillin-resistant Staphylococcus aureus (MRSA) since this is a very difficult and dangerous bacterial species to treat and eliminate. Carbuncles can make a person quite ill so antibiotic treatment becomes necessary. Oral antibiotics such as clindamycin or doxycycline may be needed. Diabetics are particularly vulnerable to boils and carbuncles since they often do not sense when the skin is damaged. Size: A pimple is a small raised area of inflamed skin, usually small in size while a boil is a much larger inflamed raised region that tends to keep growing in size. Type of bacterium: A pimple often has the bacteria Propionibacterium acnes present while a boil has only the bacterium Staphylococcus aureus present. Abscess: While a boil is always an infected abscess, a pimple does not always become infected. Furuncle : A boil is also called a furuncle while a pimple is not. Comedones : Pimples can be known as comedones while boils are not known as comedones. Carbuncles : Boils can form carbuncles while pimples can’t form carbuncles. Outbreak : An outbreak of pimples on the skin is called acne; this is not what boils are called. Treatment: A pimple can be treated with salicylic acid while boils are not treated with this. Drainage: Boils usually have to be cut open and drained while pimples do not have to be cut open and drained. Cause: Pimples are often caused by hormonal changes; this is not the case with boils. Pimples and boils both occur on the skin and result from blocked sebaceous glands. Superficially pimples and boils can look the same but they are not. However, pimples are small structures which can be closed (comedones), or open (pustules, papules). Pimples usually occur in teenagers due to hormonal changes, while boils occur more often in overcrowded unhygienic conditions or in people with compromised immune systems. Pimples can be treated with over the counter creams and usually are not excised or drained. Pimples also are not always inflamed or infected. Boils usually have to be excised (cut out) and drained and they may also require antibiotic treatments. This is because boils by definition are infected. Boils are also known as furuncles and can join together in the subcutaneous tissue to form larger structures called carbuncles. Several pimples together form a condition known as acne. Boils can become dangerous if infected with antibiotic resistant bacteria such as MRSA. Boils and pimples can both be quite painful and are best prevented by keeping the skin clean. Dr. Rae Osborn. "Difference between Pimple and Boil." DifferenceBetween.net. June 15, 2018 < http://www.differencebetween.net/science/health/difference-between-pimple-and-boil/ >. Holland, Kimberly. “How can I prevent pimples from forming?” Healthline. Healthline Media, 2016, https://www.healthline.com/health/beauty-skin-care/how-do-pimples-form#causes.